Earlier today, I had the privilege to deliver the opening keynote at the Mobile 2.0 event in San Francisco. This posting consists of a copy of the remarks I prepared. My topic is Open Source, as a key catalyst for Mobile Innovation 2.0. Let’s start by fast forwarding five years into the future. Imagine that we are gathered for the 2013 “Mobile 2.0” conference – though the name may have changed by that time, perhaps to Mobile 3.0 or even Mobile 4.0 – and perhaps the conference will be taking place virtually, with much less physical transportation involved. This has happened before. When the first Symbian OS smartphones reached the market in 2002 – the Nokia 7650, and the Sony Ericsson P800 – they received rave reviews in many parts of the world. These Symbian smartphones were celebrated at the time as breakthrough devices with hitherto unheard of capabilities, providing great user experiences. It is only in retrospect that expectations changed and we came to see these early devices as quaint, clunky, and slow. It will be the same with today’s wonder phones. That’s because the devices of five years time will (all being well) be so much more capable, so much slicker, so much more usable, and so much more enchanting than today’s devices. If today’s devices are smart phones, the devices of 2013 will be super smart phones. These devices will be performing all kinds of intelligent analysis of data they are receiving through their sensors: their location and movement sensors, their eyes – that is, their cameras – and their ears – that is, their always-on recording devices. They’ll also have enormous amounts of memory – both on-board and on-network. Based on what they’re sensing, and on what they know, and on their AI (artificial intelligence) algorithms, they’ll be guiding us and informing us about all the things that are important to us. They’ll become like our trusted best friends, in effect whispering insight into our ears. We can think of these devices as like our neo neo-cortex. Just as primates and especially humans have benefited from the development of the neo-cortex, as the newest part of our brains in evolutionary terms, so will users of super smartphones benefit from the enhanced memory, calculation powers, and social networking capabilities of this connected neo neo-cortex. In simple terms, these devices can be seen as adding (say) 20 points to our IQs – perhaps more. If today’s smartphones can make their users smarter, the super smartphones of 2013 can make their users super smart. That’s the potential. But the reality is that it’s going to be tremendously hard to achieve that vision. It’s going to require an enormously sophisticated, enormously capable, mobile operating system. Not everyone shares my view that operating systems are that important. I sometimes hear the view expressed that improvements in hardware, or the creation of new managed code environments, somehow reduce the value of operating systems, making them into a commodity. I disagree. I strongly disagree. It’s true that improvements in both hardware and managed code environments have incredibly important roles to play. But there remain many things that need to be addressed at the operating system level. And all this must be supported, not just for one device, but in a way that can be customised and altered, supporting numerous different form factors and usage models, without fragmenting the platform. Finally, please note that all this is getting harder and more complex: every year, the amount of software in a top-range phone approximately nearly doubles. So in five years, there’s roughly up to 32 times as much software in the device. In ten years, there could be 1000 times as much software. With so many problems that need to be solved, I will say this. The most important three words to determine the long-term success of any mobile operating system are: Developers, Developers, Developers. To repeat: the most important three words for the success of the Symbian platform are: Developers, Developers, Developers. We need all sorts and shapes and sizes of developers – because, as I said, there are so many deep and complex problems to be solved, as the amount of software in mobile phone platforms grows and grows. No matter how large and capable any one organisation is, the number of skilled developers inside that organisation is only a small fraction of the number outside. So it comes down to enabling a huge pool of productive and engaged developers, outside the organisation, to work alongside the original developers of the operating system – with speed, creativity, skill, and heartfelt enthusiasm. That’s how we can collectively build the successful super smart phones of the future. Just two weeks ago, the annual Symbian Smartphone Show put an unprecedented focus on developers. We ran a Mobile DevFest as an integral part of the main event. We announced new developer tools, such as the Symbian Analysis Workbench. We will shortly be releasing new sets of developer APIs (application programming interfaces) in new utility libraries, to simplify interactions with parts of the Symbian programming system that have been found to cause the most difficulty – such as text descriptors, two phase object construction and cleanup, and active objects. But the biggest step to engage and enthuse larger numbers of developers is to move the entire Symbian platform into open source. This will lower the barriers of entry – in fact, it will remove the barriers of entry. It will allow much easier study of the source code, and, critically, much easier participation in the research and creation of new Symbian platform software. We are expecting a rapid increase in collaboration and innovation. This will happen because there are more developers involved, and more types of developers involved. That’s why the title of my talk this morning is “Open Source: Catalyst for Mobile Innovation 2.0”. The “2.0” part means greater collaboration and participation than ever before: people not just using the code or looking at the code, but recommending changes to it and even contributing very sizeable chunks of new and improved code. The Open Source part is one of the key enablers for this transformation. Mastery of the methods of large-scale Agile development, allowing rapid response to changing market needs. Here’s the problem. Fragmentation is easy, but Integration is hard. 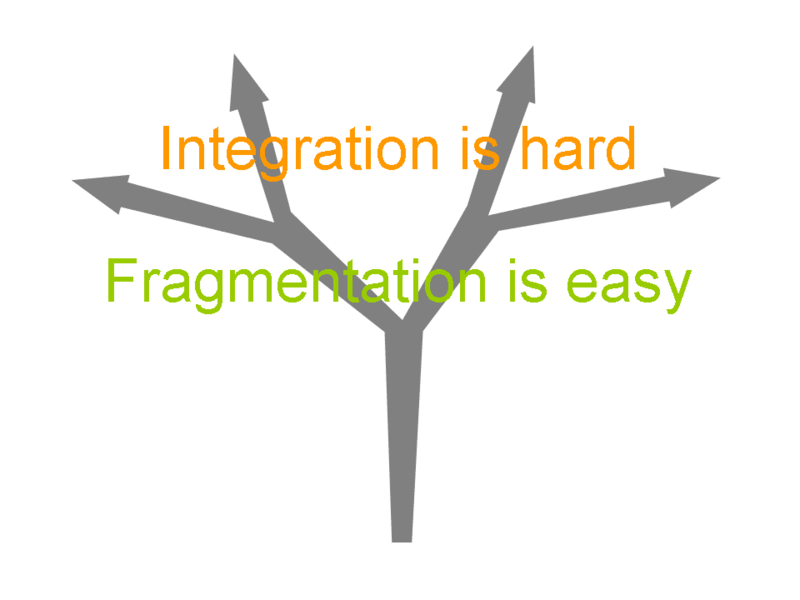 Fragmentation means that different teams or different customers pull the software in different directions. You end up, in the heat of development in a fast-moving market, with different branches, that are incompatible with each other, and which can’t be easily joined together. The result is that solutions created by developers for one of these branches, fail to work on the other branches. A great deal of time can be wasted debugging these issues. Here, I speak from bitter experience. During the rapid growth days of Symbian, we lost control of aspects of compatibility in our own platform – despite our best efforts. For example, we had one version called 7.0s and another called 7.0, but lots of partners reported huge problems moving their solutions between these two versions. Because of resulting project delays, major phones failed to come to the market. It was a very painful period. Nowadays, in the light of our battle-hardened experience, Symbian OS is a much more mature and stable platform, and it is surrounded and supported by an ecosystem of very capable partners. In my view, we have great disciplines in compatibility management and in codeline management. The result is that we have much better control over the integration of our platform. That puts us in a better position to handle rapid change and multiple customer input. That means we can take good advantage of the creativity of open source, rather than being pulled apart by the diverse input of open source. Other platforms may find things harder. For them, open source may bring as many problems as it brings solutions. This addresses the fragmentation inside a single operating system. But the problem remains of fragmentation across different operating systems. Although competition can be healthy, too many operating systems result in developers spreading their skills too thinly. The mobile industry recognises that it needs to consolidate on a smaller number of mobile operating systems moving forwards. The general view is that there needs to be consolidation on around three or (at the most) four advanced mobile operating systems. Otherwise the whole industry ends up over-stretched. Reliability issues, such as a proven track record for incrementally delivering new functionality at high quality levels in accordance with a pre-published roadmap. Again, which will be the winning operating systems, over the next five years? My answer is that is slightly too early to say for sure. The next 12-18 months will be a time of mobile operating systems proving themselves. Perhaps three or four operating systems will come through the challenge, and will attract greater and greater support, as customers stop hedging their bets. Others will be de-selected (or merged). For at least some of the winning smartphone operating systems, there will be an even bigger prize, in the subsequent 2-3 years. Provided these operating systems are sufficiently scalable, they will become used in greater and greater portions of all phones (not just smartphones and high-end feature phones). Here’s how I expect the Symbian platform to prove itself in the next 12-18 months. Our move to open source was announced in June this year, and we said it could take up to two years to complete it. Since then, planning has been continuing, at great speed. Lee Williams, current head of the S60 organisation in Nokia, and formerly of Palm Inc and Be Inc, has been announced as the Executive Director of the Symbian Foundation. The Foundation will make its first software release midway through the first half of 2009. Up till that point, access to internal Symbian OS source code is governed by our historical CustKit Licence and DevKit Licence. There’s a steep entry price, around 30,000 dollars per year, and a long contract to sign to gain access, so the community of platform developers has been relatively small. From the first Symbian Foundation release, that will change. The source code will be released under two different licenses. Part will be open source, under the Eclipse Public Licence. This part has no licence fee, and is accessible to everyone. The other part will be community source, under an interim Symbian Foundation Licence. This is also royalty free, but there is a small contract that companies have to sign, and a small annual fee of 1,500 dollars. I expect a large community to take advantage of this. This interim community source part will diminish, in stages, until it vanishes around the middle of 2010. By then, everything will be open source. We can’t get there quicker because there are 40 million lines of source code altogether, and we need to carry out various checks and cleanups and contract renegotiations first. But we’ll get there as quickly as we can. There’s one other important difference worth highlighting. It goes back to the theme of reducing fragmentation. Historically, there have been three different UIs for Symbian OS: S60, UIQ, and MOAP(S) used in Japan. But going forwards, there will only be one UI system: S60, which is nowadays flexible enough to support the different kinds of user models for which the other UI systems were initially created. To be clear, developers don’t have to wait until 2010 before experimenting with this software system. Software written to the current S60 SDK will run fine on these later releases. We’ll continue to make incremental compatible releases throughout this time period. What you should also see over this period is that the number of independent contributors will increase. It won’t just be Nokia and Symbian employees who are making contributions. It will be like the example of the Eclipse Foundation, in which the bulk of contributions initially came from just one company, IBM, but nowadays there’s a much wider participation. So also for the Symbian Foundation, contributions will be welcome based on merit. And the governance of the Foundation will also be open and transparent. I’ll close by returning to the vision for 2013. Inside Symbian, we’ve long had the vision that Symbian OS will be the most widely used software platform on the planet. By adopting the best principles of open source, we expect we will fulfil this vision. We expect there will in due course be, not just 100s of millions, but billions of great devices, all running our software. And we’ll get there because we’ll be at the heart of what will be the most vibrant software ecosystem on the planet – the mobile innovation ecosystem. Thank you very much. I mostly agree with everything you said, and your vision was always pretty exciting. But my real concern is that after so many years, Symbian has still failed to create great tools for developers. One would ask for examples? – On target debugging still doesn’t work properly, especially with large binaries. Agreed, there’s definitely lots of work to do, to address the kinds of issue you list. However, the new organisational setup which will be introduced in the wake of the approval of Nokia’s acquisition of Symbian (and the creation of the Symbian Foundation) should enable a sizeable step change in the speed at which the Symbian ecosystem addresses these issues. Why didn’t you steer the discussion at FOM in this direction? I am also wondering why you are not trying to explore a non-os specific scenario? Developers and service designers do not want to be bound to a single platform when developing a service for the masses. So it would make much more sense to se a bright future with cross-platform standards set by an independent party (W3C?). If the industry will not agree on standards quickly enough Adobe (or some other company) will provide their own. >"I am also wondering why you are not trying to explore a non-os specific scenario?…"
That question is too large to answer in this comment. I’ve made a new top-level posting to try to address it.